My penchant for pie comes from my thoughts on the word “handmade.” I love the physical manipulation of ingredients — from the hand kneading of a pile of yeasted dough to the gentle fluffing and folding of airy batters — that is necessary in baking. Handmade pie puts the mark of the maker’s hands on display, bared for all to see, critique, profit from. The force with which one’s hands and forearms wield the pin dictates the thickness of the crust. Its tenderness comes from the restraint exercised when hand-tossing wet with dry, as a little voice in your head shouts, “gluten is the enemy.” The flakes become visual representations of the way in which your fingers broke up the butter (or many times, in my case, how my fingers pressed “pulse” on the food processor…). Every move of your thumb and forefinger is on display in the crimped outer rim — the size of your fingers dictating the size of the folds. When offering your pie, you offer a piece of yourself, your personality, your strength, your patience, your practice. While I try to fill my summers with as many juicy, double and lattice-crusted fruit pies as possible, it’s during this transition period, before the fruit is ripe, when I crave something light and airy, that I often turn to tarts – elegant, streamlined versions of pies. They may look prettier or more sophisticated to some (personally, I find beauty in the rusticity of pie), but really, they’re easier. And when pâte brisée is swapped for pâte sucrée, they are infinitiely easier. If you can make a cookie, you can make a proper pâte sucrée. Fill your buttery, lightly-sweetened crust with some lemon curd or pastry cream, and you’re done. 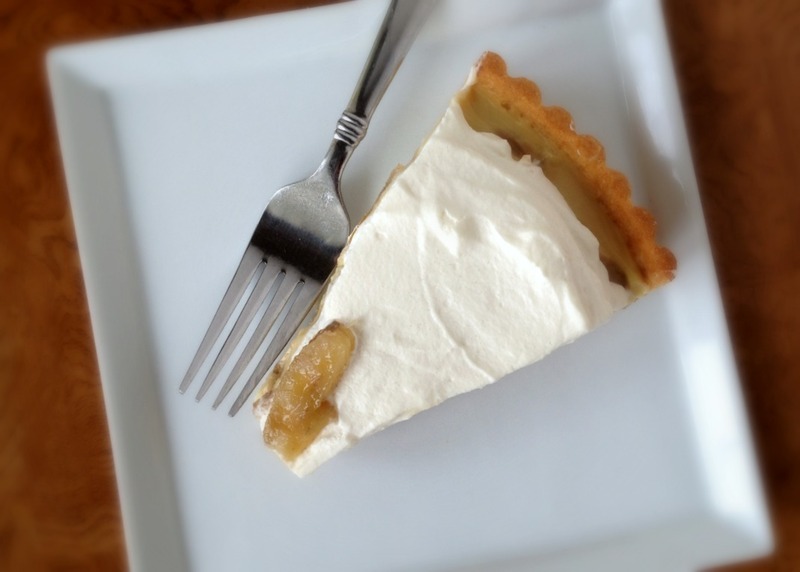 My current tart obsession is a recipe I’m calling, “New-School Banana Cream Tart,” because I adapt a classic diner pie and make some happy flourishes that do not transform, but rather dress up this favorite. The custard is a brown sugar pastry cream — its butterscotch notes complement thinly sliced bananas perfectly. 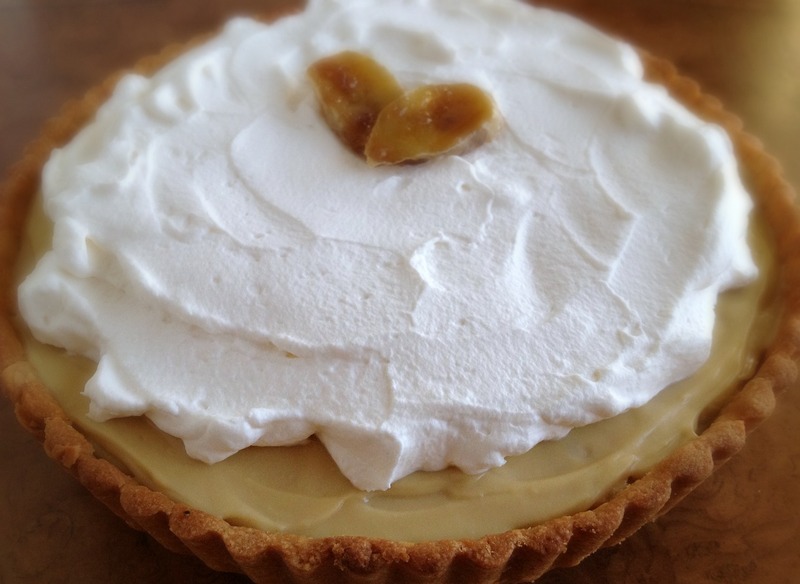 The sour cream pumps up the whipped cream so that it offsets the richer custard, and it’s molded into a big cloud. And forget an egg white seal; the crust stays crisp with a slick of caramelized white chocolate — a drug, I swear, even for white chocolate haters. ** Caramelization and Maillard Browning turn white chocolate baked and manipulated in a low oven into a deep, rich, entirely new thing. It doesn’t shout to assert its presence; its first duty is to protect the crust, but it lingers on the tongue just a little longer than everything else, adding a buttery caramel finish. The tart dissolves on the tongue; the crisp of the well-browned pâte sucrée reminds you that you did, in fact, just eat something. It’s a new favorite. **I’ve been experimenting with Caramelized White Chocolate for about a year now. Stay tuned for future recipes in which it’s used in a bigger way! This recipe looks long. If you include the caramelized white chocolate, I highly suggest you make the crust (don’t bake it) and custard in advance. None of the components are difficult on their own! adapted from Baking From My Home to Yours, by Dorie Greenspan. For original recipe, see book. Meanwhile, in a large saucepan, whisk the yolks together with brown sugar, cornstarch, and salt until well blended and thick. Whisking without stopping, drizzle in about a 1/4 cup of hot milk to temper the yolks. Still whisking, pour in the remaining milk in a steady steam. Place the pan over medium heat and whisk the mixture constantly, making sure to get the edges of the pan. 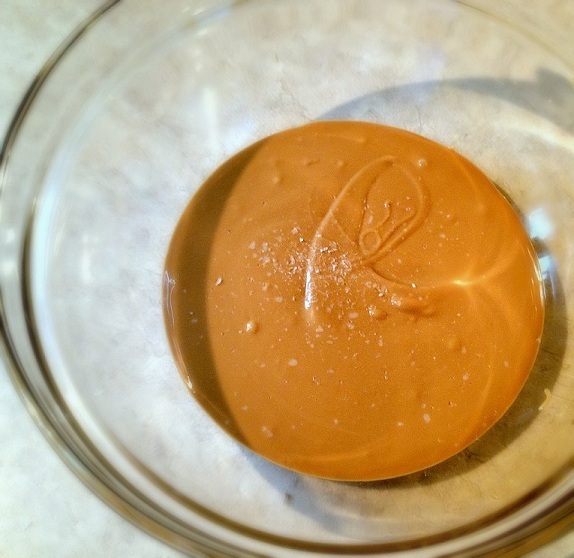 Once you see a bubble reach the surface, whisk for another 1-2 minutes until thickened. Remove from heat. Whisk in vanilla extract. Let stand for 5 minutes, then whisk in bits of butter until fully incorporated and the custard is silky. Transfer to a bowl, and press a piece of plastic wrap against the custard and wrap the bowl. Refrigerate at least 4 hours before using or up to 3 days. Pour about 1/4 cup of caramelized white chocolate onto the base of the crust. Using a small, offset spatula, spread a very thin coating of the chocolate on the bottom and up the sides of the tart shell. Scrape out any excess. Place in the refrigerator to firm up. When ready to assemble the pie, vigorously whisk the pastry cream to loosen it. Cut bananas into slices between 1/8 and 1/4-inch thick. 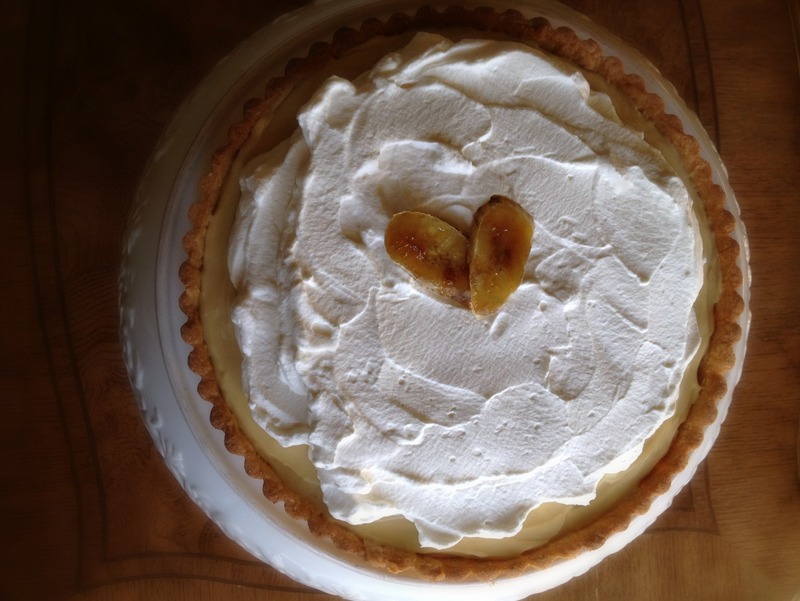 Using a small offset spatula, spread a thin layer of pastry cream (about 1/4 of it) on the bottom of the tart shell. Top with half of the banana slices. Spread about 1/3 of the remaining pastry cream evenly over the bananas. Top with remaining bananas. Spread rest of pastry cream evenly on top of the last layer of bananas. Whisk together sour cream and heavy cream until combined. Beat until it just starts to thicken. Beat in sugar and vanilla and continue beating until it hold firm peaks. Place the whipped cream on top of the custard in a mound. With a small offset spatula, spread the whipped cream across the tart, leaving an uneven 1/2 to 3/4-inch border of pastry cream peaking through. Do not mound the cream towards the center as you would for a cream pie. Make cloud-like swoops, using the back of a soup spoon. Top with bruléed bananas, if desired. 1/2 cup (1 stick/114 grams) unsalted butter, at room temperature, cut into 8 pieces. In a stand mixer, cream the butter, sugar, and salt on medium speed for 2-3 minutes until pale and light. Scrape down the bowl. Add flour and beat on low for 30 seconds, until incorporated — it should look like wet sand. Add egg yolk and mix on low for 30 seconds, or until the dough comes together. Gather dough and wrap tightly in plastic wrap, pressing it into a 1-inch disk. Refrigerate for at least 1 hour (alternatively, you can keep in in the fridge for up to 5 days or in the freezer for up to 2 weeks. Thaw overnight in fridge before using). Lightly butter a 9-inch tart pan. Let the dough sit at room temperature for about 20 minutes to soften. With a rolling pin, bang the dough a few times to flatten to a 1/2-inch round. Roll out the dough on a floured work surface. Roll out the dough into an 11-12 inch diameter, just under 1/4 inch thick. Roll the dough around the pin and transfer to the buttered tart pan. Press the dough from the base, up the sides of the pan, getting into all crevices. Be thorough, but don’t batter the dough too hard. Patch any tears. Trim the dough even with the rim of the pan. Freeze the shell for at least 30 minutes (alternatively, the shell can be tightly wrapped and refrigerated for up to one day or frozen for up to 2 weeks. Bake directly from freezer). Preheat oven to 350 degrees F. Press a square of lightly buttered aluminum foil, butter side down, tightly against the tart shell. Bake for 25 minutes. Remove foil and continue to bake for 10-15 minutes until the shell is firm and golden brown. Please note: You will not need all of this chocolate for the tart; however, I would not advise caramelizing a smaller yield. No worries! Keep the leftover chocolate in an airtight container in the refrigerator and heat it back up as you want it. Dip strawberries, spread on baguette, eat off spoon. Spread white chocolate and oil evenly in a small baking dish (mine was 10 x 6). Bake in oven for 10 minutes until melty. Spread the chocolate around with a spatula. Repeat this process for 30-60 minutes, stirring every 10 minutes. Don’t worry if it looks lumpy and unpleasant midway through the process. It will smooth out. If desired, strain the white chocolate to remove any remaining little lumps. Stir in salt. I quite often find cream pies a bit too thick and sickly with all that whipped cream and rich filling, but your version here is calling to me! It looks very refined and full of gorgeous flavours… Looking forward to more caramelized white chocolate recipes too! Yum. Can you send a piece over for my morning coffee? I so love tarts. They’re so beautiful and versatile. Looks like you’ve made a phenomenal one here! You sold me at the title. I am so excited to try this. Caramel and banana is one of my favorite combinations. I wish banoffee was more easily found in the states. EH Chocolatier from Somerville sells caramelized white chocolate, it’s fabulous. Yes! With cacao nibs and sea salt! It’s lovely, but I wish they caramelized it just a bit further. 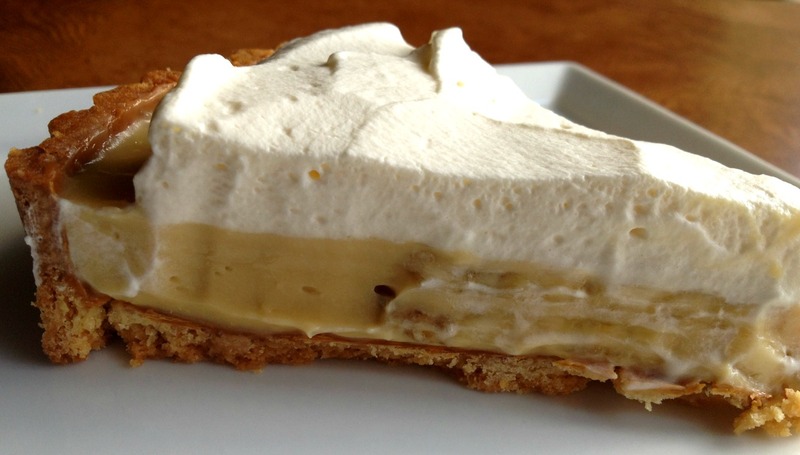 You’re right, banoffee pie is the best.